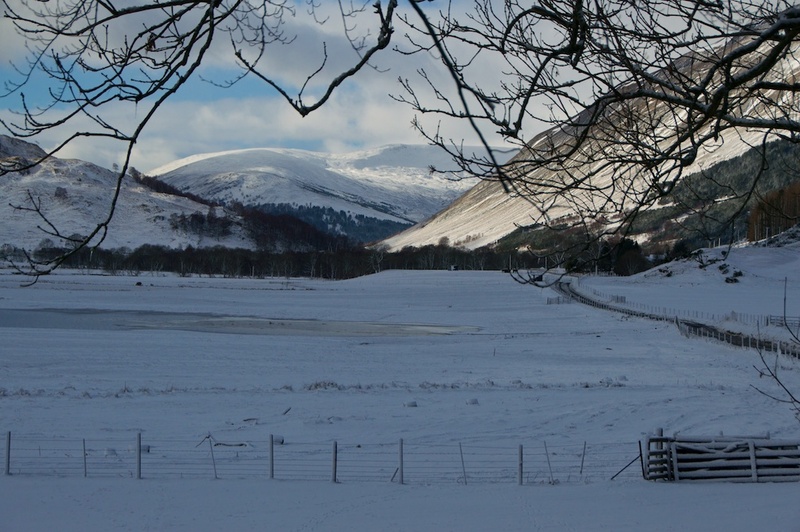 Further up Glen Lyon from Carnbane Castle, the valley widens slightly and opens out with views of distant mountains, which, on a cold afternoon in February, were cloaked in snow and shadowed in powdery hues of blue and lilac. 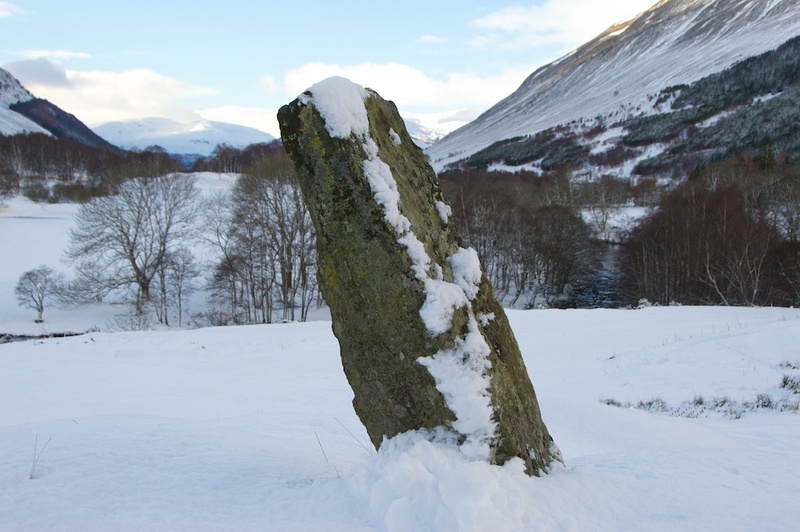 I’d heard of a standing stone called Adamnan’s Cross, and was prepared to have to climb over a fence and plunge ankle-deep into the snow in order to find it; but in fact it was surprisingly easy to see, being close to the road on a slightly raised hummock of ground, on the south side of the glen. So what’s special about Adamnan’s Cross, other than the glorious view that it has enjoyed every day for the last couple of thousand years? Firstly, although it bears the name of an early Christian saint, it probably started out in the Bronze Age, as a standing stone. What it marked or signified is now lost to time. 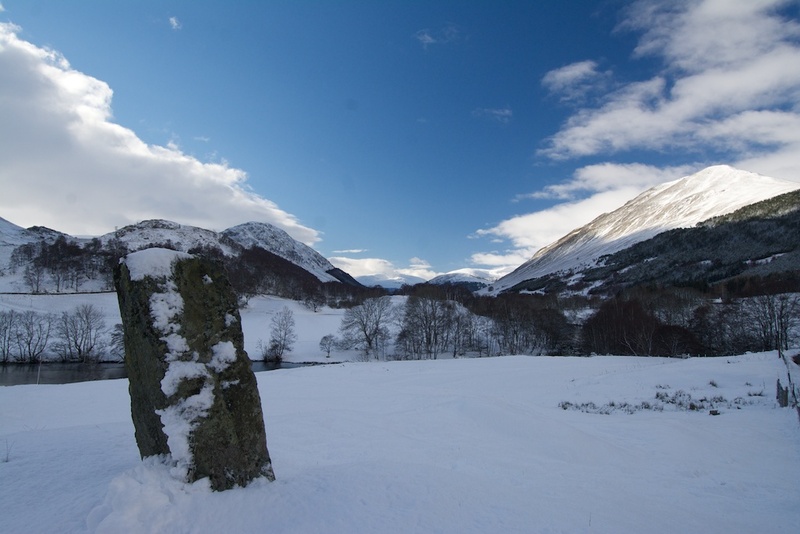 But in the 7th century, Glen Lyon is said to have been visited by St Adamnan, an Irish-born missionary who was a distant relative of St Columba. Born about 624 AD in County Donegal, Adamnan was the ninth Abbot of the monastery on Iona. He travelled widely, and was responsible for writing the biography – or hagiography, more precisely – of St Columba. In Gaelic, his name is pronounced ‘ad-OV-nan’; it is also spelled Adomnan, and some historians identify him as St Eonan or Eunan. According to the local historian Duncan Campbell, writing in the late 1800s, St Adamnan and another missionary, St Fillan, travelled from the west to spread the gospel throughout central Scotland, and they drew lots to decide the regions where they would preach. 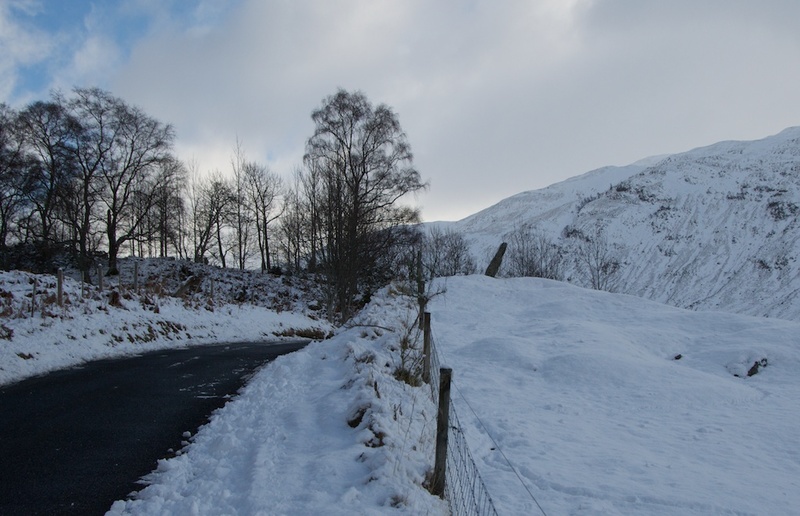 To St Fillan fell the area now known as Strathfillan, while St Adamnan headed towards Glen Lyon, where he set about building a water mill and a chapel. Meanwhile, up in Glen Lyon, a child was already suffering from the dreaded disease, and the people turned to Adamnan in despair. Is na leig oirnn e nios no ‘n nuas. rise and check the plague of thy people. Adamnan gathered all the people together on a mound where he habitually preached to them. He raised his hand, drew the evil energy towards him, and channelled it into a large round boulder that was lying nearby. To everyone’s amazement, a hole appeared in the stone at the spot where the plague had entered it. He then sent the remaining healthy inhabitants up into the sheilings or summer dwellings until the danger had passed. Later, when everyone had returned to their homes, the rock became known as ‘Craig-diannaidh’, the ‘rock of safety’. 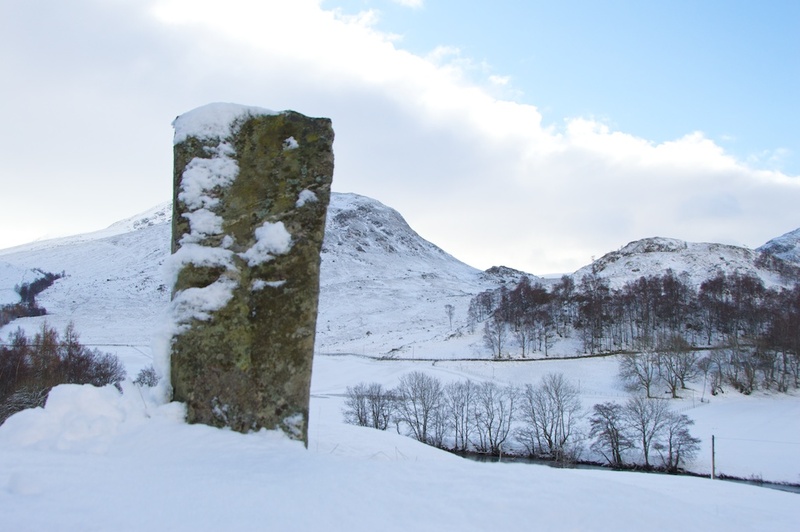 Duncan Campbell tells us that an upright stone was erected nearby, to mark the spot where Adamnan stood, and he suggests that it originally had arms which have since been broken off; this tends to contradict the other theory, that it was a standing stone of Bronze Age origin. 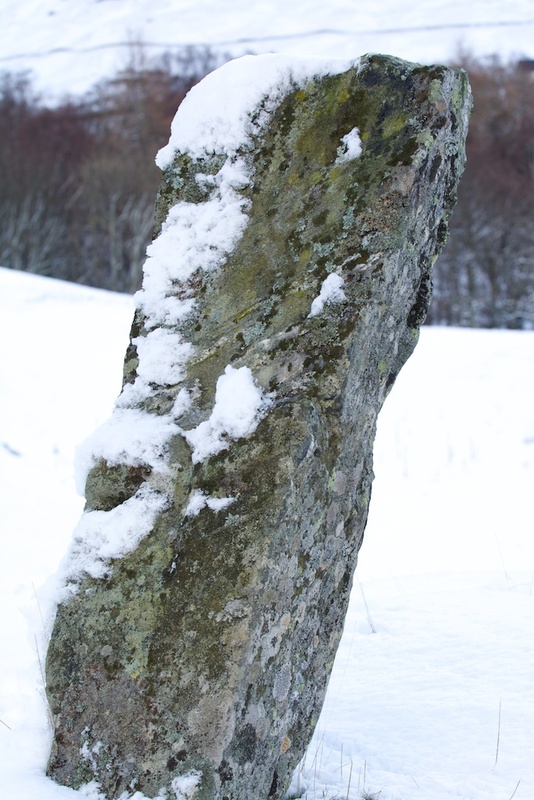 Having inspected it at close range, I can’t see any evidence of broken arms, and I’m tempted to say that it is a much older monolith that was later carved with cross-symbols, like the one at Camas nan Geall in Ardnamurchan; but there is no real way of knowing. I didn’t see the boulder with the hole in it, but after all I wasn’t looking for it! I believe it is now hidden among the trees on the other side of the road. 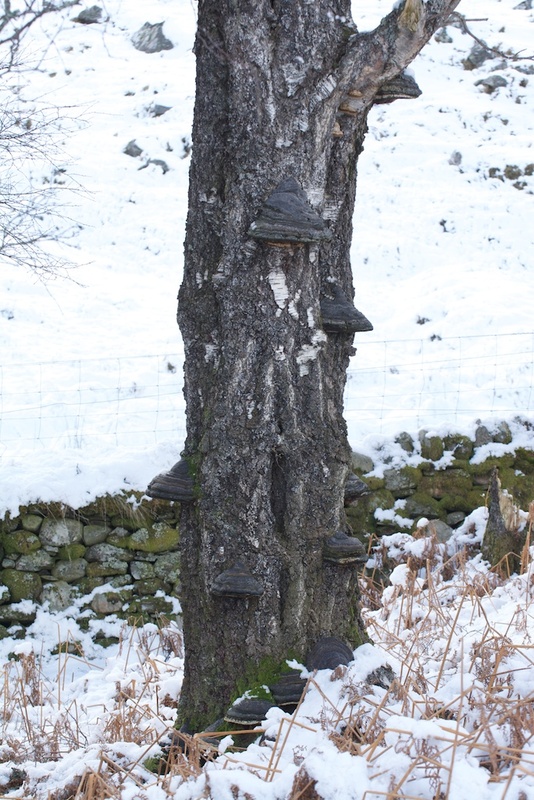 But, interestingly, while I was photographing the cross, Colin was mooching around looking at lichens and mosses, and noticed a tree with bracket fungus sprouting at intervals up the trunk. This was almost directly opposite the cross, and it must therefore stand very close to the ‘rock of safety’, where the plague is said to have disappeared. 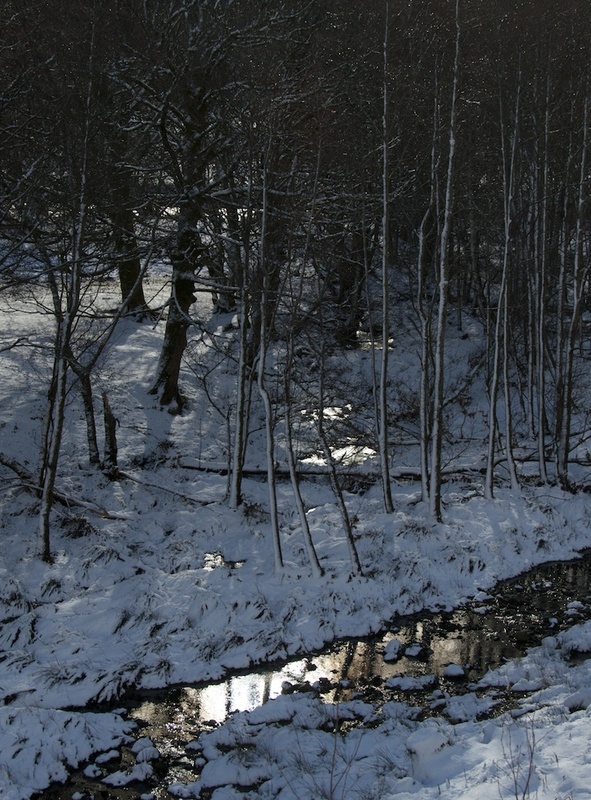 The Northern Antiquarian says that “the rocky slope immediately above the stone… was the home of an old urisk, who, sadly, long-since left the area – though his spirit can still be felt there.” An urisk or ùruisg is a spirit-creature like a brownie or a hobgoblin, said to haunt waterfalls and pools. They seek human companionship, but rarely succeed because of their off-putting appearance: they are described as having a long face and nose, pointed ears, dirty skin, and the legs of a goat. If I’d known this when we were there, who knows what I might have discovered? As for the standing stone, it must be nearly four feet high, but is leaning at quite an angle over to the south; it’s covered in lichen, but it is still possible to make out the cross markings on its surface. 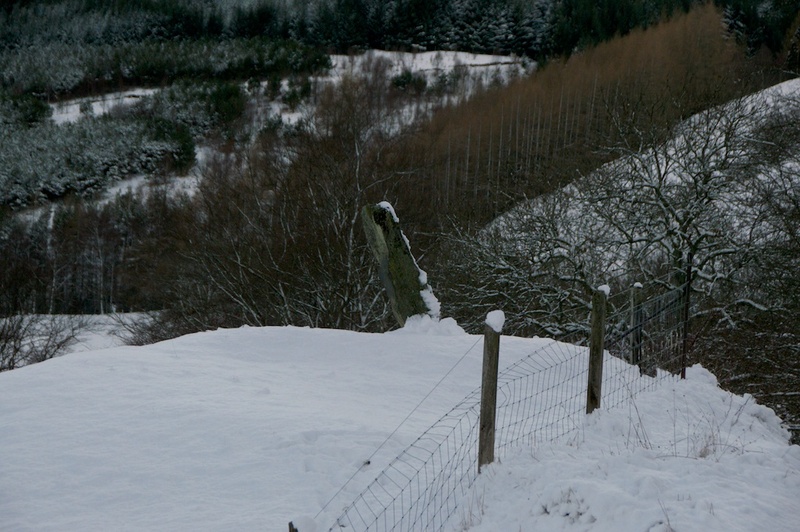 The RCAHMS database says that the mound on which it stands is called ‘Tom a’ Mhoid’, or ‘moot hill’. It is suggested by one source that St Adamnan died on Iona, but a strand of folklore claims that his grave lies not too far from the place where he performed his miracle. 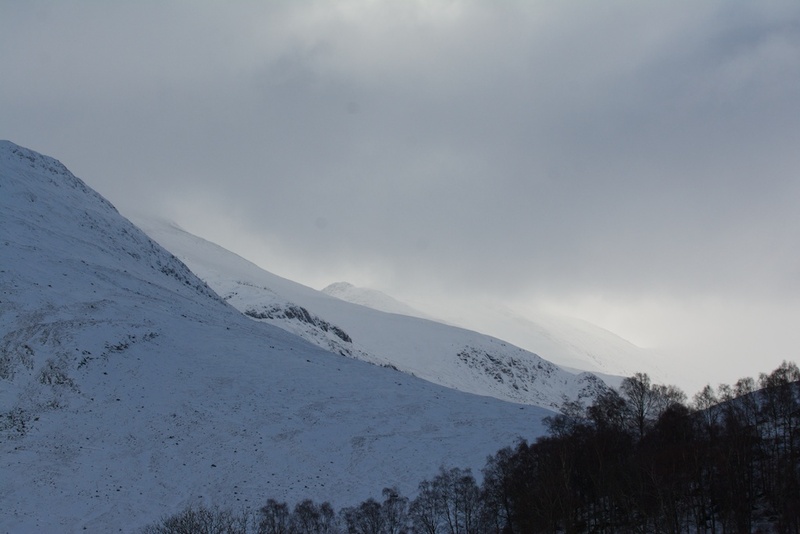 As he grew near the end of his life, he was asked by the people of Glen Lyon where he would like to be buried. He told them to build him a bier and attach ‘lunnan’ or sticks to it for carrying; these should be lashed to the coffin with ‘dullan’ – whips of withy (willow). His friends were to bear him down the glen, and when the first withy strap broke, that was where he should be buried. It’s impossible to know how true this is, but it’s a perfect explanation for the rather strangely named village of Dull, between Fortingall and Aberfeldy, which is the place where the first withy strap broke and the ‘patron saint’ of Glen Lyon was traditionally laid to rest. 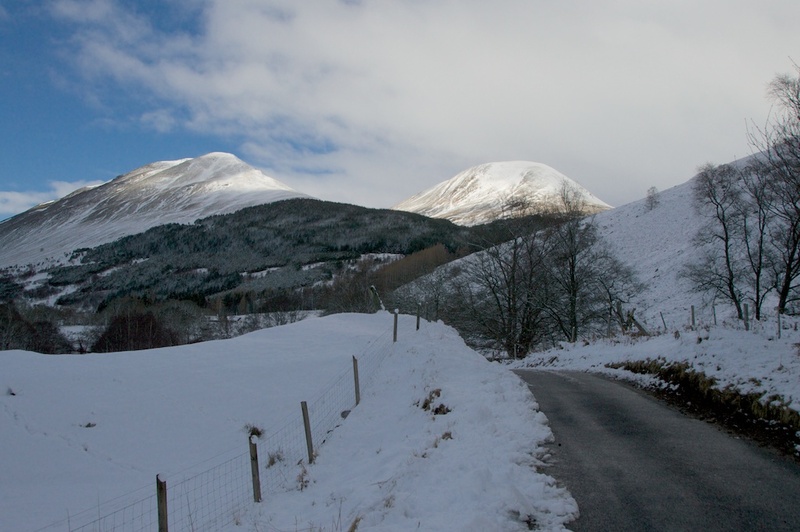 Further west in Glen Lyon, at Bridge of Balgie, Adamnan is remembered in the place names of Eilean Eonain (the island of Eonan or Adamnan) and Milton Eonan, the site of his mill. This whole glen is wrapped in legend. 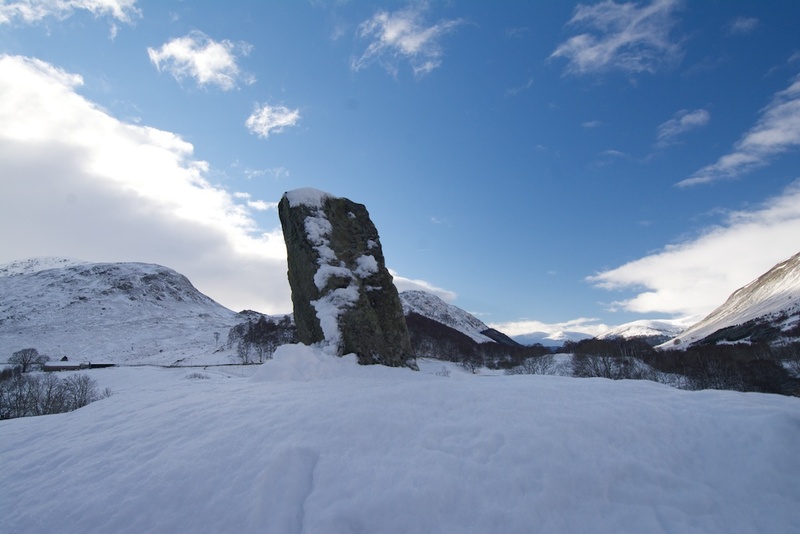 Duncan Campbell talks of a chain of 12 round towers which were the ‘castles of the Fingalians’, the earliest chiefs of Glen Lyon, about whom little or nothing is known. Several of them are clustered at the western end, in a place called ‘Cashlie’, which means ‘castles’. 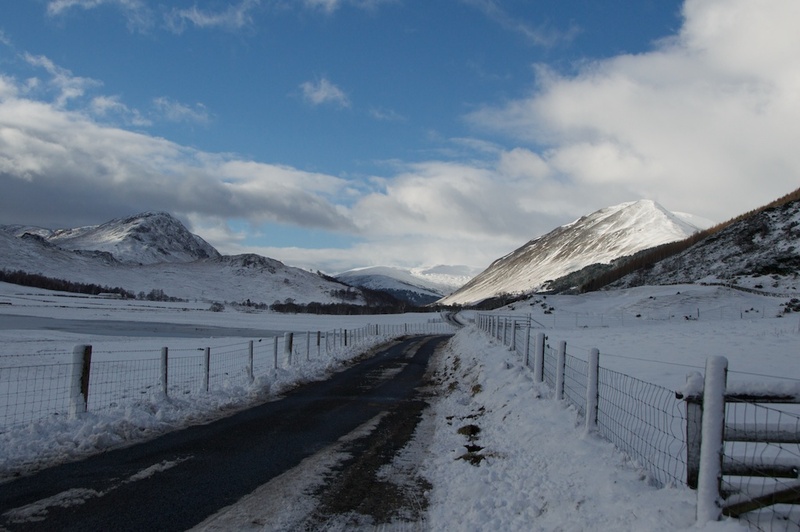 At the time of Adamnan’s arrival, Glen Lyon was known as ‘Gleann dubh crom nan garbh chlach‘ – ‘the black crooked glen of large stones’. And it’s fascinating to think that all this would be remembered by the Fortingall yew, an ancient tree that still stands in the nearby churchyard. My thanks to Northern Antiquarian, whose excellent website helped me to find the stone. I know, Lynne, it would be good if they could speak! Thank you! We missed it too, David, the first time. I knew roughly where to look on our second trip, but it’s still not that easy to spot – it’s a long road and there are lots of bends! I have read a few things about St. Adamnan on the Internet. It is interesting that because of him, in 697 The Council of Tara(I don’t know how translate this in EN) adopted a statement that women and children were protected (prohibiting the murder of women and children during a war). Interesting. His feast in on September 23, each year in Orthodox Church. Thank you, Cornell! That’s interesting. The Council of Tara would be a council of the High Kings of Ireland, I would think. I read somewhere that Adamnan disagreed with St Columba because he adopted the practices of Rome in tonsuring (shaving) his head a different way, and in the different way of calculating the date of Easter. 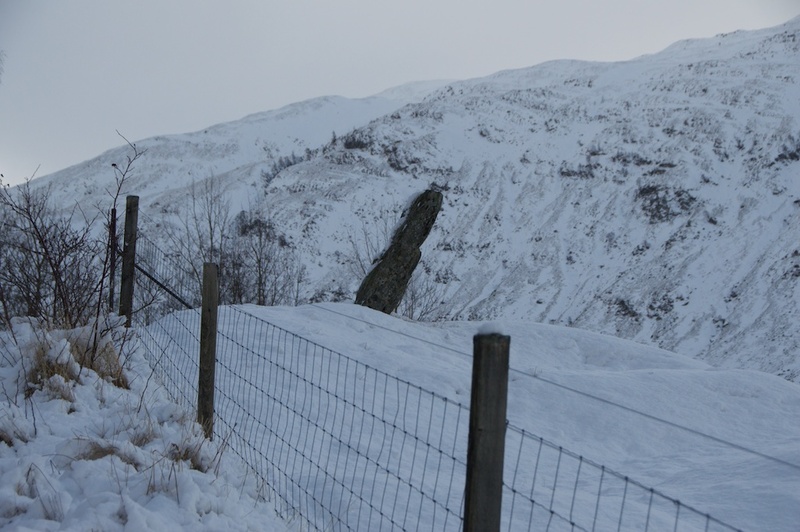 It’s amazing to think of him building a home and a mill in Glen Lyon. Interesting, that, Jo. Hope your ankles have warmed up. Thanks, Alen! Yes, not bad, it was my bum that was the coldest, having skidded down a steep hill a bit later on!